The question was first asked in 1984 and is now being asked again after a gap of over 25 years. 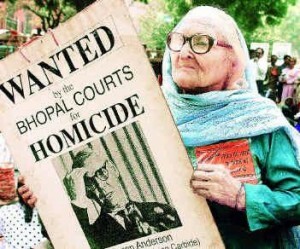 Thanks to the June 7 verdict in the Bhopal gas disaster case, which has brought the nation out of its deep slumber to be on the side of victims, who are fighting against the injustice. Warren Anderson, the then chairman of the Union Carbide Corporation, USA, was in Washington with his wife Lillian. He had enjoyed the performances at the Kennedy Centre gala the previous evening. The next morning, i.e. December 3, 1984, he was to leave for Danbury. He woke up in the morning only to be greeted by a bombshell of news: methyl isocynate gas has leaked from the Union Carbide plant in Bhopal and killed a large number of people.This brought a few more wrinkles on the face of six-foot-two-inch tall, 63-year-old lanky man. After a series of meetings, interactions and thoughtful exchanges with his company colleagues, Anderson decided to visit Bhopal. Those consulted included Keshub Mahindra, chairman of the Indian subsidiary UCIL. Anderson wanted to have first-hand knowledge about the catastrophe, which he thought “will leave a stigma on him and his company”. On December 6, Anderson reached Bombay. He was accompanied by a team of Carbide experts to review the situation at the Bhopal plant. Mahindra and other Indian officials of the company joined him at his spacious suite in Taj Hotel to draw out a strategy for the Bhopal visit the next day. Next day Anderson reached Bhopal in a regular service flight of Indian Airlines at around 9.35 a.m. The door of the plane opened only after the Collector Moti Singh and the Superintendent of Police Swaraj Puri had reached at the tarmac of the Bairagarh Airport. The door opened and soon entered two officers inside the plane. One of them pronounced the names of Anderson, Mahindra and V.P.Gokhle, Managing Director of the UCIL. They were asked to descend first while other passengers remained in their seats. The visitors were greeted by the two smiling faces of Moti Singh and Swaraj Puri. After a warm hand shake. They were taken into a waiting car of the collector at the tarmac itself. Three visitors occupied the back seat and the collector on the front seat with his S.P., who was on the driver’s seat. “Thank you very much” were the words of Anderson for the two, who thought that the officers were taking care of him out of courtesy for a company chairman, who has flown to Bhopal, all the way from America. This however was futile. The two officers were acting under instructions from the Chief Minister Arjun Singh, who was a worried man due the rising popular sentiment against his government. He wanted to gain some sympathy by acting tough. This was the election time in India. Arjun Singh has been on a campaign trail with the Prime Minister Rajiv Gandhi, who was on a two day state tour to address election rallies. Singh communicated his orders to the authorities in Bhopal for the arrest of the three on arrival. Once the arrests were made, Arjun Singh’s PR department took over. They went on to issuing press leases which talked tough with a vow to get justice for the victims. But this did not remain so for a long. No sooner the arrests took place, a sequence of behind the scene dramatic events had started taking place. It was all between Washington, Delhi, Bombay and elsewhere. James A. Becker, a Bombay based American diplomat, who accompanied Anderson to Bhopal, reached the Carbide guest house after a little while. He was refused entry by the police force guarding the gates. The media crowds too were out there insisting on an interview with Anderson but in vain. Guards were under instructions not let anybody cross the iron gates of the guest house. Disappointed Becker swung into the action fast. This started the reenactment of a 1927 Fritz Lang movie ‘Metropolis”; a chain reaction of picking over the phones, one after another. Gordon Streeb, charge d’ affairs, at the American Embassy in New Delhi and holding the forte in the absence of the Ambassador after having heard all his calls from Bhopal dialed a number to do a final calling on his part. It was foreign secretary of India Krishna Rasgotra, who heard streeb expressing the displeasure of his country’s displeasure over the arrest of Anderson. He wanted an immediate release of him. Rasgotra, in turn acted fast. He passed the information on to the Cabinet secretary for the communication to the Prime Minister, who by than had reached Harda, a constituency in Madhya Pradesh. With this started the reversed action replays of the entire act. Prime Minister did speak to the Chief Minister immediately. Chief Minister did communicate to his officers in Bhopal sounding soft this time. This was the bail time for Anderson. The bail on record for Rs.25,000 is in the name of one Carbide employee A.N.Kuruvilla, who later informed the court that he was made to sign the surety papers forcibly by the local police. That too on December 8, when Anderson was already out and in Delhi. However, his surety amount was forfeited by the court. Unaware of this entire drama happening in different parts of the world, we, the media persons were standing out at the gates of the Carbide guest house. This consisted of a large number of foreign media. In the disgust of waiting for a long time, I climbed a wall of some adjacent collapsed structure to have a peep into the guest house. To my utter amazement, I could not notice any visible activity inside the guest house. I informed the situation to friends down there. As soon I came down, Mark Finn of Philadelphia Inquirer ( I hope I remember this correctly) arrived on the scene to announce that Anderson has already been released. It was his source in the American Embassy. This enraged the waiting media crowd. We decided to confront the police and gatecrash to enter inside the guest house. The police force failed to stand before a unanimous and joint action of the media. But there was a disappointment waiting for us inside. Anderson has already been whisked away from the side exit in the collector’s car to the Bhopal Airport. The state plane, ready to take off for Delhi, was just waiting for its lone passenger at the Bairagarh Air Port. This was all under instructions from Chief Minister Arjun Singh’s office. The passenger arrived in the car. He looked around at the people out there on the tarmac. Climbed the plane’s staircase.Waved his hand. An officer there responded to this with a salute. Capt. S.H.Ali , took off to Delhi without a minute’s loss. At the Delhi Air Port, an embassy official has been waiting for Anderson. He was driven straight to the embassy, where Gordon Streeb has been waiting for him. Anderson, later at a press conference on December 10 in Danbury said ‘I want to stress that we were treated with the utmost courtesy and consideration. The reason given for holding us in the guest house was concern over my security’.